The musical currently on stage at the Wagon Wheel Theatre in Warsaw is rated R. But, if you can get past the language and remember it is sent in New York and the real world, you will enjoy the show. This encore musical is very different than the shows produced during the regular Wagon Wheel season as it packs a punch that isn’t often seen in this area and, like it or not, it’s about living in America. “Rent” is set in New York City’s East Village in the 1990s and features a talented cast portraying a group of impoverished young artists who are all struggling to survive. Mark Cohen (Matthew Janisse) and Roger Davis (James Murray) are roommates. Mark is a filmmaker who serves as narrator for the show and Roger is a rock musician. Both are accomplished actors and turn in super performances. Their friend, Tom Collins (Charles Benson), is a gay professor who planned to surprise them Christmas Eve but is mugged. Benson, like Janisse and Murry, is an accomplished actor. He turns in a first-rate performance. Mark and Roger’s landlord and former roommate Benjamin Coffin III (Demetruis Spidel), demands their rent be paid. However, they can’t afford it. Spidel turns in a super performance as he does everything he can to get his rent money, including padlocking the loft apartment where the two men live. Angel Dumott Schumard (Javier Ferreira), finds Collins in an alley and tends to his wounds. The two become attracted to each other and learn they are both HIV positive. So is Roger. Angel is a cross dresser and Ferreira does a terrific job, even walking in high heels. Mimi Marquez (Leigh Ellen Jones), a neighbor and exotic dancer said she was, “born to be bad.” She flirts with Roger and they fall in love, but have secrets from one another. Jones is great as the “bad” girl. Joanne Jefferson (Sarah Jackson), a lawyer, is the new girlfriend of Maureen Johnson (Ellen Jenders) a former girlfriend of Mark’s. Mimi uses drugs. Collins nurses Angel, whose health is declining and he/she eventually dies. “Rent” is a mix of straight and lesbian couples and their on, off, relationships. Completing the cast and complementing those listed above are members of the ensemble — Jennifer Dow, Kira Lace Hawkins, Lexi Lyric and Dan Smith. During the evening the musical takes many twists and turns. It’s about life in the city. It’s about things we really don’t think about in Kosciusko County. It’s full of the language heard in the East Village. Hats off to Director and Choreographer Scott Michaels for another outstanding job. Many of the songs are energetic and so is the cast as they dance and sing their way into the hearts of the audience. Songs like “Light My Candle,” by Mimi and Roger; “La Vie Boheme/I Should Tell You,” by the ensemble; and “Your Eyes,” by Rodger add to the musical. In all there are 22 songs in the first act and 17 in the second act, all telling the story of the people involved. 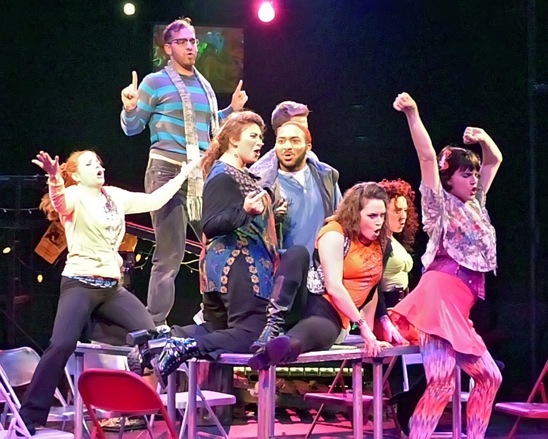 “Rent” continues at 8 p.m. Sept. 3, 5 and 6 at 7 p.m. Sept. 4 and at 2 p.m. Sept. 6 and 7. For tickets call 574-267-8041 or online at wagonwheeltheatre.com.